I got an email a couple of weeks ago from Tom McFeeley, a fantasy sports writer, asking other fantasy baseball writers to tell him what their walk up song was. You know, the music that plays as the batter makes his way from on deck circle to the batter’s box. It’s a 10 second sting that define you sonically. For instance, last year Francisco Lindor used Digital Underground’s The Humpty Dance as his walk up song. Unfortunately, I was traveling when the email came in and I didn’t act right away and I missed out. I’m not one of the 64 songs in the brackets Tom is running. You can read about it here, and vote your heart. Someone deserves to win. Apart from lacking some really important historical context (My projections were the first fantasy content on ESPN, and I, along with Greg Ambrosius and Alex Patton and editors David Schoenfield and Rob Neyer, put up the first fantasy coverage) it’s a fun read, and listen, and made me sorry I hadn’t gotten in on it. When Tom asked I didn’t have a walk up song, but my first thought was the Modern Lovers Roadrunner would be pretty good. The first 10 seconds would be killer, but maybe the countdown and singing would get tiresome, in which case the break from about 30 seconds to 40 seconds would be great. Why? For me, growing up, listening to baseball after bedtime on the radio, sometimes from as far away as Detroit, is what Jonathan Richman’s tribute to late night radio and rock ‘n’ roll evokes for me. As reliable as spring and the cry, “I’m in the best shape of my career,” comes the 2015 edition of Patton $ Software. 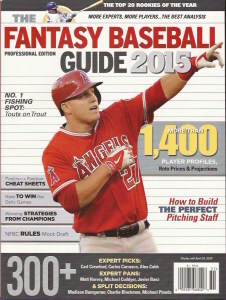 The software contains my 2015 baseball projections, my suggested bid prices (and Mike Fenger’s) for 5×5 and Alex Patton’s 4×4 bid prices, prospect lists and expert league draft results, as well as ways for you to enter your own bids, make up-to-the-minute draft lists for your fantasy drafts, edit and automatically adjust the projections and show what players earn with different statlines. In short, everything you might need to prepare to win your fantasy league this year. There is a new procedure for buying this year. Go to pattonandco.com and register, if you’re not already registered. Click the menu item that says Subscribe and follow the instructions (essentially, click the blue button, enter your payment information, and authorize payment for $36). Beat Rotoman in a Daily Game, this Friday! It’s free! And if you beat me you can win a $10 entry to a future game. I don’t know much about that, but what I do know is that I’ve never played a daily game before. So I’m inexperienced. I know, too, that while the illustration shows a football player, I’m playing baseball. I also know this game is the work of a guy named Brandon Ward, who runs a Daily Game site called Advanced Sportstistics. You can register and join FreeRoll3 from this page. Brandon’s gimmick is advanced stats. Hitters accrue points for Runs Created, among other things, while pitchers gain points for FIP (and, non analytically, wins). I’m not sure about the categories, there seems to be a problem with redundancy, but the game is free, so I’m going to give it a try. And I’m going to beat you. 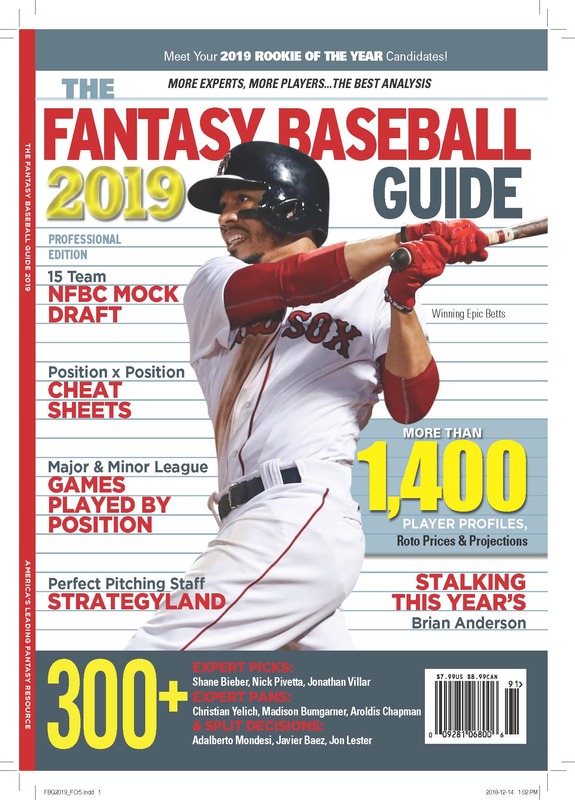 The New York TImes has an informative story today about the rise of the daily fantasy baseball game, which has been embraced by MLBAM and managed to avoid being classified as a game of chance. The writer quotes a guy who says he works 35 hours a week playing the game and made $50,000 last year, which seems very possible. It also mentions a recent surge of casual players who are increasing the pools. It might be time to start playing. Chris Liss has a history of trying to calculate historical fantasy prices. He recounts that history in a post at Rotowire that is well worth reading. His post reminded me of my first post as a short-lived Baseball Prospectus writer back in 1999. I wrote a long impassioned screed hating on ESPN, my former employer, for totally misunderstanding the fantasy game and the informational needs of us players. BP Bowdlerized it, probably for my own good, but frustratingly. They left the results of my data driven look into baseball history intact. What I did was calculate roto values, in league context, for every year in baseball from 1903. The results are interesting because of the way they demonstrate Stephen Jay Gould’s point about the way that a limited sample increases the relative achievement of the elite. The point, I think, is that in a small league with limited talent, the best players dominate in ways that can’t happen when the game is more universal and talent is more widely distributed. What would it be like to play roto in 1915? My values win, hands down. That’s what they calculate. But Chris measures something else that has its own value. Wise Guy Baseball is Here! Gene McCaffrey is a fine baseball and fantasy baseball mind, as well as a deft turner of phrases, and a killer rock’n’roll guitarist/songwriter. Plus he’s funny. He writes about the fantasy game (or rather, games, including salary cap and NFBC format games for big money) in Wise Guy Baseball, his book. 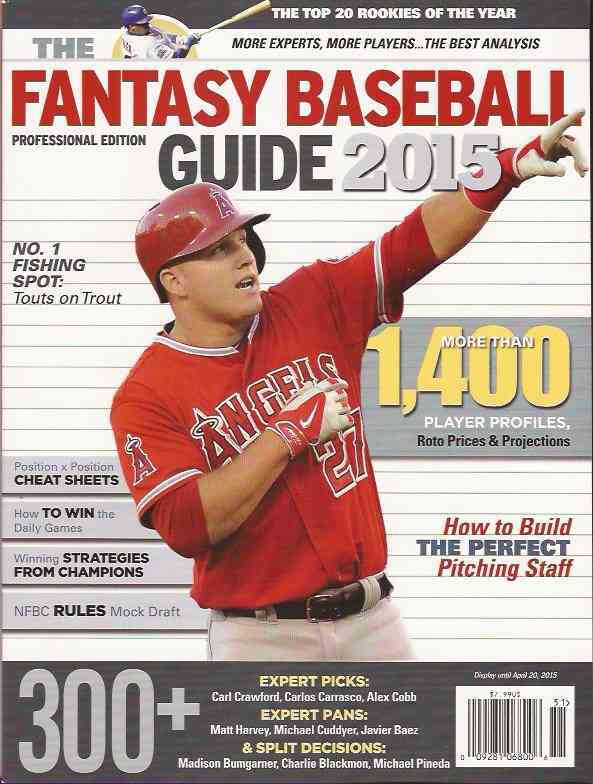 He also contributes to the Fantasy Baseball Guide via his Picks and Pans. Ordering info at wiseguybaseball.com. Go now!